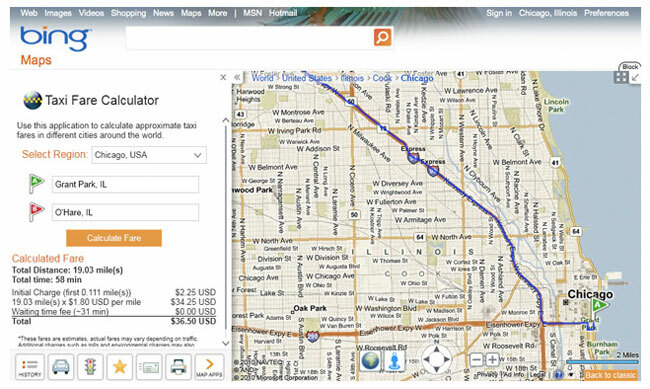 As Bing maps continues to grow and add features the service becomes more and more impressive. The latest addition is the Taxi Fare calculator that calculates your expected fare by factoring in pick-up, time, and distance charges and will even calculate the shortest route making sure your not taken for a ride. The new app is being considered for Microsoft’s King of Bing Maps competition together with other entrants GeoSalesTax, Random Location, and World of Football. Looks like its already won to me. The winner will soon be selected by a panel that includes CNET’s Josh Lowensohn, Search Engine Land’s Greg Sterling and Directions’ Joe Francica. Expect the announcement to show up on the Bing blog on August 20th. Microsoft still has an uphill battle if it wants to complete with the main players in the map market such as Google Maps and Mapquest.